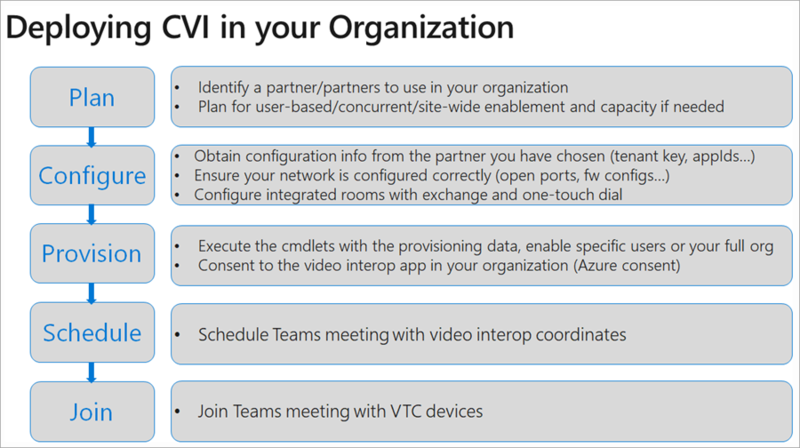 Cloud Video Interop (CVI) is a Microsoft Qualified third-party solution that enables third-party meeting rooms (telepresence) and personal video devices (VTCs) to join Microsoft Teams meetings. With Microsoft Teams, you get rich online content collaboration in meetings that include audio, video, and content sharing. This can be enjoyed through the desktop and web client, as well as through many partner devices that integrate natively with Microsoft Teams. However, many customers have already invested in video teleconferencing and personal video communication devices, which can be expensive to upgrade. Cloud Video Interop provides an easy solution, allowing you to keep using your existing solutions until you are ready to upgrade. With Cloud Video Interop, Microsoft Teams delivers a native meeting experience for all participants – in meeting rooms or inside of Teams clients. Is Cloud Video Interop for me? Cloud Video Interop provides an intermediate service while you transition to a full native Microsoft Teams Solution, using Teams endpoints. The service provided should be part of your migration path. While Cloud Video Interop provides a great intermediate solution, we encourage our customers to look into our native Teams Meeting solutions, such as Teams Room Systems, for the long term. The following partners have video interop solutions for Microsoft Teams. Your company may choose to work with any combination of these partners within your enterprise. Cloud Video Interop is a third-party service that is offered by our partners to provide interoperability between existing video conferencing and personal video device solutions on premises, and Microsoft Teams. The solutions offered by our partners consist of components that can be deployed either fully cloud based or partially/fully on premises. The following diagram shows the high-level architecture of our partner solutions. When deploying a Cloud Video Interop solution, it’s important to understand that you are deploying a partner solution. The general steps you should take to deploy Cloud Video Interop are listed in the following diagram. During the plan phase, you should identify the devices that you will not replace with a native Teams device, and find a Cloud Video Interop partner that can support these devices. It’s also important to understand that you will need a license for each user who will schedule meetings in which you want a Cloud Video Interop-enabled device to join. Note that exact licensing requirements can be obtained from the Cloud Video Interop partner. Ensure that this is clear before you start your deployment. The partner that you have chosen for your CVI deployment will provide you with a full deployment document that consists of all the steps needed to deploy successfully within your organization. This will include firewall ports and IP ranges, configuration changes for your devices, and other settings that need to change. After a user is enabled for Cloud Video Interop, any meeting scheduled using either the Teams Meeting Add-in for Outlook or the Teams Client will have the appropriate additional information automatically added into the Teams meeting so that Cloud Video Interop-compatible devices can join these meetings. You can dial in to the partner's IVR using the tenantkey@domain. When you are in the partner IVR, you will be prompted to enter the VTC conferenceId, which will then connect you to the Teams meeting. You can directly dial in to the Teams meeting without interacting with the partner’s IVR by using the direct dial feature, using the full string of tenantkey.VTC ConferenceId@domain. If you have an integrated Teams room, you can use the one-touch dial capabilities offered by your partner (without needing to type any dial string). After Cloud Video Interop is deployed, you can manage the devices using the solutions provided by our partners. Each partner will provide you with an administrative interface that will include both license and device management. Reporting is also available directly from the partner administrative interface. For more information on reporting capabilities, contact the partner of your choice. Cloud Video Interop is a partner-provided service. If you are experiencing issues, the first step is to connect a device that has the Teams Client installed and connect it to the same segment as the Cloud Video Interop device that is causing problems. If Teams functions correctly on this segment, and you have also followed all the networking and configuration guidelines the partner has provided, you will need to contact the partner for further troubleshooting. The following PowerShell cmdlets are available for you to (partially) automate the Cloud Video Interop deployment. Get-CsTeamsVideoInteropServicepolicy: Microsoft provides pre-constructed policies for each of our supported partners that allow you to designate which partner(s) to use for Cloud Video Interop. This cmdlet allows you to identify the pre-constructed policies that you can use in your organization. You can assign this policy to one or more of your users by leveraging the Grant-CsTeamsVideoInteropServicePolicy cmdlet. Grant-CsTeamsVideoInteropServicePolicy: This cmdlet allows you to assign a pre-constructed policy for use in your organization or assign the policy to specific users. New-CsVideoInteropServiceProvider: Use this cmdlet to specify information about a supported CVI partner that your organization would like to use. Set-CsVideoInteropServiceProvider: Use this cmdlet to update information about a supported CVI partner that your organization uses. Get-CsVideoInteropServiceProvider: Use this cmdlet to get all of the providers that have been configured for use within the organization. Remove-CsVideoInteropServiceProvider: Use this cmdlet to remove all provider information about a provider that your organization no longer uses.